Creating a pattern is a many step process. I’ve recently been playing with the project management tool Trello and setting up a master list of all the steps it takes to get a pattern from concept to publication. I created 17 items that need to be to be completed for test knitting alone! This post is step 7 or so: announcing the test knit on my blog. 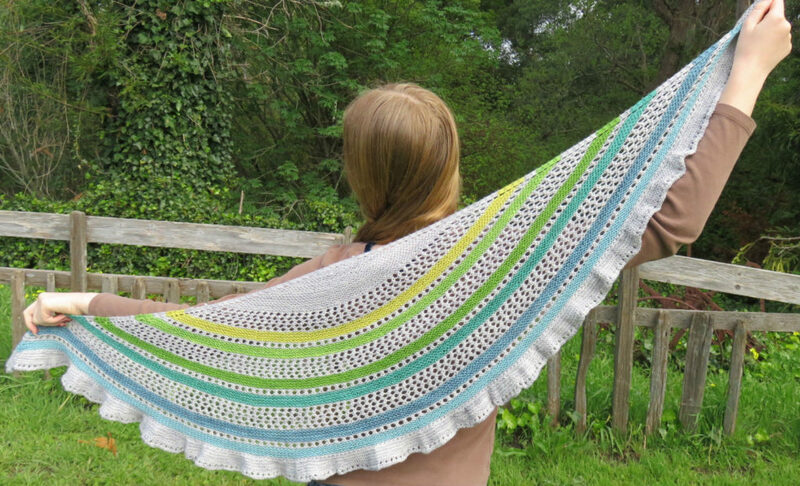 So, on that note, I would like to show you the Vedru Shawl. Vedru is a classic top down crescent shawl design perfect for using a special collection of mini-skeins. There are no complex stitches or purling in this lovely, peaceful garter stitch lace knit. The design works well with solid yarns, tonal yarns, or yarns with subtle variegation. The pattern includes directions for two sizes with six or eight stripes. All directions are written. If you are interested in participating, please visit my Ravelry group, Heddi Craft Designs, and sign up in the test thread.